Elastic Drums is a new iPhone app, it offers 6 tracks that can be easily programmed as 16step patterns, that can be chained and programmed as as song. 4 fx incl. reverb and gated reverb can be automated to it and recorded in realtime. Free Promo Codes – der frühe Vogel..
the shown screen shot tells it – it’s a fm capable and offers 4 synth engines of this complexity shown in here – this is not bad and has the classic stuff in it and a more complex kind of bringing noises in for snares and hihats and tonal stuff with a little noise stuff in it for bass drums and hihats – and there is clap and an FM percussion synth as well. 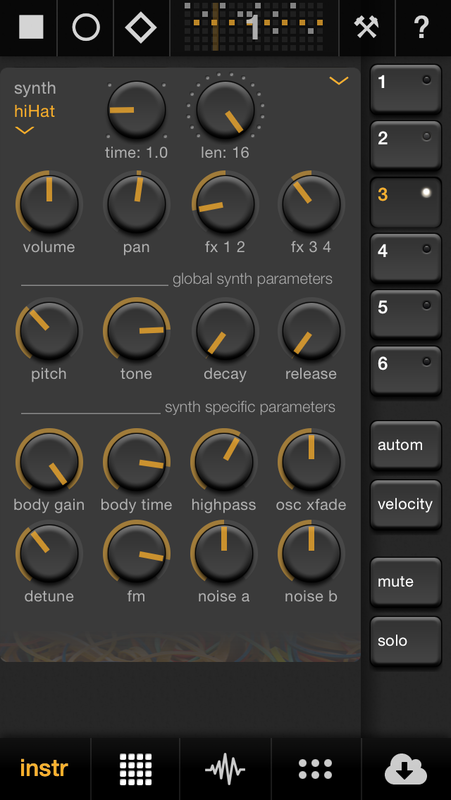 there are even 4OP FM engines, grain, wobble and tom is also in – so this more comparable to the Elektron Machine drum than any other app or toy. the grain-one is more for handclaps and other stuff and is not about samples but something like a „nebula of dense noise“. Wretch-Up – FX Looper based on input by Mouse on Mars looks very simple in the looks – it is 4 faders – a looper and with filter and feedback – in use you can perform on it a lot more than it looks – and yes – it has the typical Mouse on Mars Pitch-Effect based on a Delay. This may sound a bit „boring“ but it is not – it reminds of playing with Electro Harmonix Loop Box it has feedback and it’s sound in a direct access and on a second „channel“ you can record, play and reverse loop the live input and change the speed. it simple ends up in sound fx that you know if you have at least one album by Mouse on Mars – it’s typical and a lot of fun and obviously made for for performance.